“There’s nothing romantic about death,” Colin Farrell says during the opening montage of this movie. “I love being alive.” These are not Farrell’s own words. The Irish actor is speaking for Simon Fitzmaurice, an Irish writer and filmmaker, whose first feature, “My Name Is Emily,” was made in 2015. And the reason Farrell is speaking for him is not because, precisely, Fitzmaurice cannot. Strictly speaking, through his voice simulator, he can; but Fitzmaurice—whose narration is adapted from a book that shares the title with this movie—and director preferred Farrell’s more robust tones. And the famous actor’s participation has further value: it attaches a marquee name to this movie. And, probably much more importantly, it is the helpful gesture of a friend. Simon Fitzmaurice was diagnosed with Motor Neuron Disease in 2008, and it has affected him to the extent that by the time this documentary was filmed, he was confined to a wheelchair, almost entirely paralyzed and reliant on an “eye gaze” computer to convey his thoughts. It was in this condition, incredibly, that he was able to direct “My Name Is Emily.” This movie, directed by Frankie Fenton, tells Fitzmaurice’s life story, one that is both heartbreaking and awe-inspiring. As he sits in his wheelchair, his handsome, unlined-by-wrinkles face now framed by a dark, boxy beard, Fitzmaurice presents a visual enigma. It’s wrenching when the movie shows still photographs and old video footage of his mobile self. Born in the 1970s into a family that loved movies, he got the writing bug early; his accounts of school, comradeship, early creative work, and love are both endearing and familiar. His elation at finding a soul mate, his wife Ruth (herself a writer) is infectious, as is his enthusiasm when his first short film is accepted to an NYU film festival, and his second gets to Sundance. There’s a cute picture of Simon and Ruth standing outside the Ed Sullivan Theatre, seeing it, you think, there’s a couple of out-of-towners you might have run into at a nearby bar and had a great time with over a few beers. All seems to be going great, only while at the Sundance Film Festival in 2008, there with another short, he notices one of his feet feeling “floppy.” Expecting a routine diagnosis from his doctor, he instead gets more or less a death sentence. He’s told he only has three or four years to live. “Is he talking about me?” Fitzmaurice remembers thinking. I reviewed “Emily” for this website, and I wasn’t crazy about it—even though I acknowledged then that its existence is a miracle and should be celebrated as such. 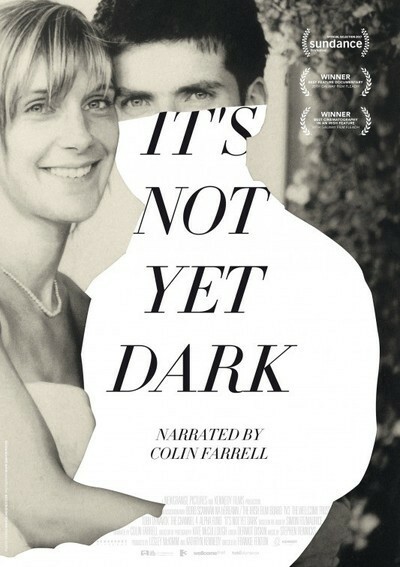 “It’s Not Yet Dark” did not change my opinion of the movie as such. But it made me hope hard that Simon Fitzmaurice gets to make another movie, and another after that, and so on.